Former Presido and his wifey, Patience Jonathan are currently on vacation in Kenya’s Mara Games Reserve. 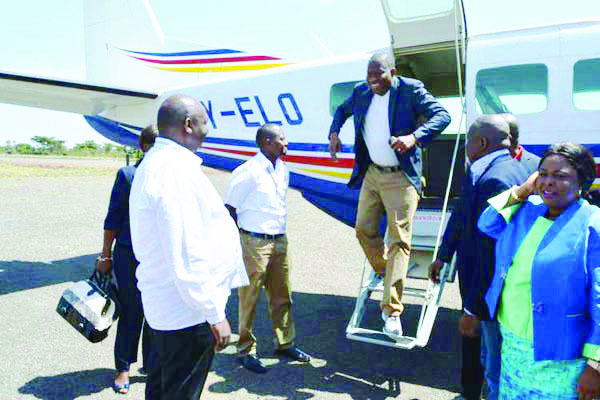 The couple landed at the Games Reserve facility in two chartered planes yesterday with two of their children. Jonathan was booked for a 3-day tour to witness the wildebeest migration. He is staying at the new Angama Mara Lodge at the Oloololo conservancy. Hehehehe see GEJ flexing muscle…enjoyment galore. Is Dame Patience The Mother Of President Jonathan’s Children? Would You Vote President Jonathan For Second Term In 2015 Presidential Election? IDIO-T! JONATHAN CAN NEVER GO TO JAIL IN A LAWLESS COUNTRY LIKE NIGERIA!!! IF JONATHAN WOULD GO TO JAIL, THEN, OBASANJO, SANUSI, BABAGIDA, FORMER NASARAWA GOVERNOR, ALL THE GOVERNORS FROM THE EAST, FORMER GOVERNOR OF EDO STATE, ETC ALL THESE PEOPLE NEEDS TO GO TO JAIL… SO STOP FOCUSING ON JONATHAN, THOUGH I DON’T LIKE HIM!. JUST WATCH HE WOULD NEVER EVEN GO TO COURT. Though,Nigeria suppose to have make a rapture growth ever before now,but it was rule and ruin by d beast,inhuman and rascalism so called government,is nt jonathan dat got it spoil to this stage,jonathan only fall the remaining standing wall, since 1999-2015 how many years? Sixteen years backward now expect 4years beautifying. Na magic? Chop-up my man Nigeria don spoil b4 u enter seat, let those that hate u bcos of where u came 4rm grab the nearest transformer, who cares ? Seconded. If the likes of Ibrahim babangida, sani abacha, abdusallam and obasanjo are walking freely, why should Goodluck’s case be different? bottom line is……Jonathan is better than all these criminal-minds dat u listed. So WTF! May God save us 4rm dis our leaders. It was not the fault of jonathan but the fault of power testy men of nigeria. Pls enjoy urself to it fullness, those past presidents that loot our money they did not see them to probe. Jonathan saved Nigeria from war, you guys should keep ur mouth shut, he tried more than the past presidents. I kind of agreed to what Anonymous said in his comment. If other criminal presidents before him are walking free, enjoying their loots,and flexing muscles, then what is wrong with criminal and highly corrupt Jonathan enjoying his loots too? But Badluck Jonathan was too dumb, low mentality, and highly incompetent that people too advantage of his foolishness to loot the country to bankruptcy in six years. I think is better to leave them all to God’s divine judgements. They have destroyed the collective destiny of millions of our people struggling daily to feed their families, get jobs, and working very hard like slaves without a comfort of life and a better tomorrow. Thank God for President Buhari who is committed and serious to better the lives of our people. I know for sure that under democratic government, PMB doesn’t have the veto power to put all these animals in prisons for destroying our nation with their looting, bad governance, poor leadership skills, mismanagement, and gross corruption. But there is God ooooooooooooooo! Who will surely judge them all for their actions that put Nigeria in gross darkness. Let this man enjoy his life, he tried his best…. I thank God for his life…he’s now looking fresh. Enjoyment gallore, Johnathan carry go oooooo. MR jona enjoy your self. It is not an ordinary holiday. Most likely on a visit to negotiate terms for exile incase probe starts. I guess Europe and America will never grant such hence uganda maybe a good place to spend exile. Mr.Ayodele,,,,Kenya’s still a no go area for GEJ,,have u 4gotten where Obama’s 4rm & how things ended b/w d 2 of them?…! With time,the full movie go..! Which ever way,Nigeria by the grace of God Almighty which has always sustained this great country right from inception will never get destroyed by any mortal man without achieving God’s purpose for her even dough it may tarry. For those past leaders who failed this country woofly,what they never understood’s that God gave them a rare opportunity & chance to be part of His divine project of building a great Nigeria.They’ve done their deed & would definitely reap what they sowed good or bad for every human on earth has just 2 days,,,a day to be born & a day 2 die.